After years of build up, Koei Tecmo has released the very first footage for Dead Or Alive Xtreme 3! Many gamers share fond memories of the previous iterations, especially the first title, Dead Or Alive Xtreme Volleyball, as this was indeed the reason why some of us originally bought the first Xbox. By using the upgraded Soft Engine 2.0 for the PS4 Version (an improved breast engine based off Dead Or Alive 5 Last Round) and the Soft Engine Lite (PS Vita Version), 4 main changes have been made to the character models. New skin shaders give off a realistic and healthy vibrancy, and breast physics have been fine tuned for maximum voluptuousness. As well, game changing booty physics have been fleshed out, along with the fact that no other game contains such realistic tanning. The main stay Camera Mode also returns. There are 9 characters in the roster, selected based on a popularity contest where the results were announced during the Toyko Game Show 2015: Marie Rose, Honoka, Kasumi, Ayane, Kokoro, Nyotengu, Hitomi, Momiji, and Helena Douglas complete the roster, with no plans for DLC. 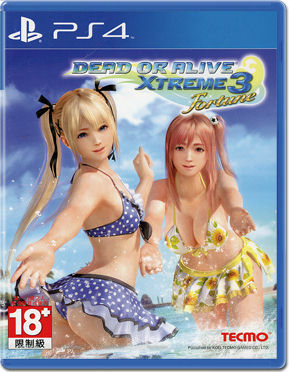 Finally, Dead Or Alive Xtreme 3 is a Japanese/Asian Region exclusive, although if a Western release happens, according to Koei Tecmo, it will be an "adjusted" version. What this actually means though, is highly based on the assumption of censorship; in the meantime, this version is the only sure bet on the original xtreme experience. This game features english subtitles.